First and foremost, Happy New Year boys! So far this year we've had some pretty cold days here in the Northeast. On one of those chilly Saturday mornings, we bundled up in our warm gear and headed out for some doughnuts, opting to go without the stroller so Grey could experience (and practice!) life as a pedestrian and, in all honesty, give me a sense of the near future without one. Our "practice" walk involved part of Convent Avenue with a brief pit stop on one of our favorite Harlem stoops. Along our journey Grey, it was obvious you want to be just like your big brother. 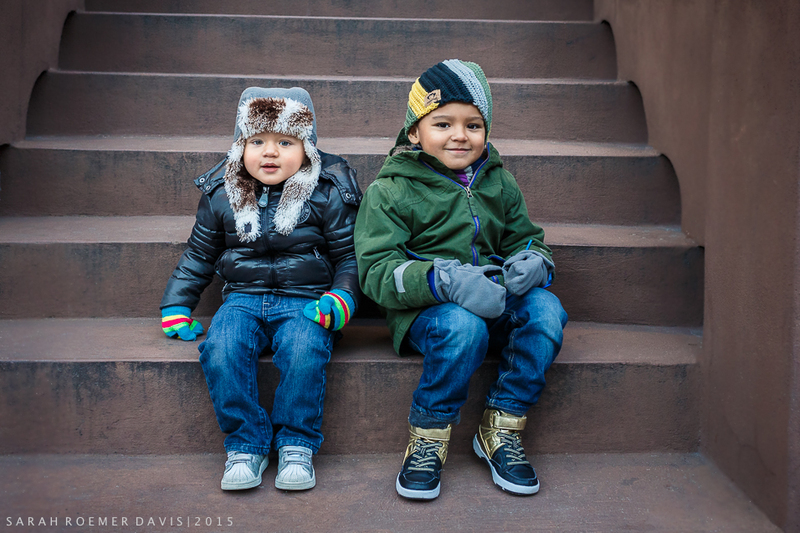 When we sat on the stoop you made the same faces as Cash, copying him when he threw his arms up in the air, and though you have very few words yet, you did your best to mimic his many sound effects. You wanted to walk for the first few blocks without any hand holding. That is, until you saw Cash reaching for my hand and then you begged for my other one. You tried to skip and jump and run like him, however you must have fallen at least a dozen times in your efforts. Sometimes you'd throw one of your overly dramatic meltdowns, but Cash, we weren't phased by it, right? We'd just pull Grey up to standing, brush him off and keep it moving, laughing to ourselves, Oh Grey, we're not buying it. It is just the beginning of 2015, and I cannot imagine nor wait to discover what the rest of our journey this year will include. I wonder what you guys will like as the months go by. Will you still be obsessed with everything Transformers, Cash? Who will be your new best friend? Will you still have a crush on Phoebe and talk to me at night about how you love everything about her? Will you like the Harlem Little League this spring? The Harlem School for the Arts camp this summer? And Grey, will you find a way to break a world record by surpassing your brother in weight? As of today you weigh just three pounds less than him and you are nearly three years younger! Will you like going to preschool this fall? Who'll be your first friend? My sweet boys, the road that lies ahead of you is long and full of promise. I hope you dance, smile, trust, love and dream. I pray you enjoy every moment - even the unpleasant ones that break your heart, but force you to reach and grow as a person. You will learn as you get older that rules are made to be broken so be bold enough to live life of your own terms, and never ever apologize for it. And most of all, trust that when one of you falls, the other one will pick you up, dust you off and tell you to keep it moving just the way a brother should. Happy New Year sons. I love you both dearly.